Seven journalists, several activists and the crew of the Freedom Flotilla ship were kidnapped by the Israeli Army in international waters. An RT journalist was searched six times and detained for a week without charge or trial. The Swedish boat Marianne, bought and equipped with donations collected across Sweden, left the port of Gothenburg in early May. On her way to Gaza, the Marianne docked at several European ports, and on June 19, it continued on its journey from Messina, Sicily. From then on my colleague Richard and I were on different boats according to our assignments. I was issued accreditation in Israel (Russian citizens don’t need a visa to enter Israel). I have been to the Gaza Strip on numerous occasions; I was once even a guest at a Zionist congress. Freedom Flotilla III consisted of four boats, with a total of 47 people from 17 countries on board. The Marianne, with 18 people on board (citizens of Sweden, Canada, Norway, New Zealand, Morocco, Spain, Tunisia and Russia), was far ahead of the rest. 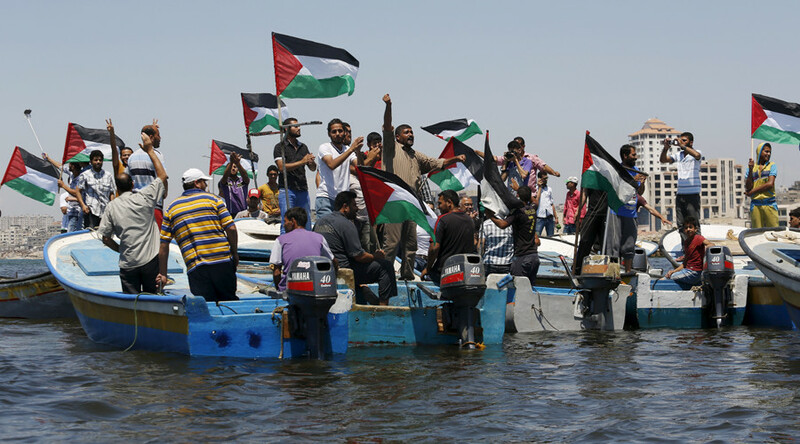 The boats that trailed behind carried all of the most valuable cargo – a deliberate step by the activists to prevent the Israeli forces from seizing the humanitarian aid. Experience from the 2010 flotilla showed that Israel doesn’t deliver any medicine, equipment or household goods to Gaza. From time to time a military helicopter, drone or plane would fly over the boat. Once, a plane flew parallel to the Marianne for some time, hovering right above the water. Sometimes there would be no satellite connection. “Come what may, we are going to Gaza. When they start preparing for an attack they’ll cut off all our communication. Until they seize the command bridge, we will continue on our way to Gaza”, said Dror Feiler, a musician who was born in Israel and served in the IDF. He left the country at 22 and renounced his Israeli citizenship. Dror’s 92-year-old mother still lives there and supports the Palestinians. She can’t visit her son because of her advanced age, while he is not allowed to visit her because of his anti-Israeli stance. Dror had taken part in all the Freedom Flotillas, so he understood the nuances of what was to come better than anyone else. While there still was some reception, however weak, I got phone calls and emails from Gaza. The phone calls dropped. People in Gaza were waiting for the flotilla like no one in the world has ever waited. Many aboard the Marianne believed that in the end Israel would choose not to notice the flotilla and let it pass. The sun set. All of us, including the former President of Tunisia, famous journalists, politicians, key figures in science and arts, were busy cleaning up on the vessel. At 1:20 am lights suddenly started flickering all around the boat. With 105 nautical miles (about 170 km) left to go to the Israeli shore, the Marianne was surrounded by four Israeli military vessels and nine coast guard boats. Thus the pirate attack on Freedom Flotilla III began. Bear in mind that the coast guard can only legally operate in territorial waters, i.e. within 12 nautical miles from the shore. Three days prior to being captured, the crew, activists and journalists saw an example of how an ordinary coast guard acts when observing the law. On June 26, former Tunisian President Dr. Moncef Marzouki, Knesset member Dr. Basel Ghattas, an Al Jazeera crew, and Ohad Herno, a journalist from Israeli TV Channel 2, arrived onboard the Marianne from Crete. The coast guard, having spotted the Marianne, asked whether the crew needed anything, never leaving their territorial waters despite requesting that we approach closer. The captain thanked them and refused, so the coast guard left. The Israeli Navy and “coast guard” acted in a different way. One of the Israeli boats approached the Marianne and directed its search light at the vessel. A man in military uniform holding a loudspeaker told the crew, the passengers and the journalists that the blockade of Gaza was lawful and demanded that the crew should stop the engine and let three Israeli servicemen on board for negotiations. Captain Joel Opperdoes said he deemed the blockade unlawful and there was nothing to talk about. He declined both the negotiations and the very idea of an ultimatum that a private vessel let someone on board in international waters. Captain Joel explained to me that such actions can be considered piracy, and when a vessel is attacked, it is the captain’s duty to prevent pirates from seizing it by putting up unarmed resistance and voicing disagreement with the capture. Any other actions, including voluntary surrender of the vessel, are considered professional misconduct. One of the oldest nautical rules adopted 500 years ago and endorsed by the UNO, reads that no nation can extend its sovereignty to or claim control of open seas. And no one has the right to encroach on the navigational freedom of a vessel unless it is involved in human trafficking, piracy or unauthorized TV and radio broadcasting. The Swiss boat Marianne was not in any way related to any of these three crimes. It should be noted that in the long history of trying to break the blockade from the sea there have been a number of successful attempts. In August and October of 2008 two small ships managed to reach the port of Gaza. It didn’t cause any repercussions in the media, unlike vessel captures by Israel, all of which are widely discussed. It is unclear why Israel persistently prevents the Freedom Flotilla from entering Gaza year after year and makes a theatrical performance out of the vessel’s capture. All this naturally does not add to the reputation of the country. Everyone surely remembers the notorious seizure of the Turkish ship, Mavi Marmara, with 700 passengers on board, which took the lives of nine activists. Two others died of wounds later. When the captain finished, the Israeli military spokesman said that the one person he cared about was the Knesset MP on board. Dr. Basel Ghattas, one of the two Palestinian members of the Israeli parliament, wrapped in a Palestinian scarf, was prepared for this scenario. He took the loudspeaker from the captain and the conversation went on in Hebrew. He said that the blockade was unlawful, just like limiting the boat’s freedom of navigation, let alone its seizure. Very soon the Israeli spokesman lost any interest in the Knesset MP and switched to the former President of Tunisia. Dr. Marzouki, a human rights advocate who has been in the trade for years, said that the claims made by the Israeli Army were illegitimate. Finally, the spokesman tried to approach Dror Feiler, an Israeli-born musician who had rejected his Israeli citizenship 40 years ago. The Marianne was still heading for Gaza, as was promised by all those who spoke to the Israelis. At 2:30 am the first soldiers came on board. Watch how the Marianne’s capture was carried out, filmed by Israeli journalist Ohad and aired on Israel’s Channel 2. This video shatters the Israeli army’s official report that the vessel was seized peacefully. The soldiers were armed with stun guns, which they used to fight the crew. I was in the front of the boat and heard Herman, a Norwegian, and Charlie, a Swede, screaming. It took the Israelis 52 minutes to engage the crew and the captain took the ship’s wheel away from them. Finally, they captured the command bridge. At that moment, the Marianne was 90.5 nautical miles away from the Israeli shore, according to the vessel’s measurements. After that, the soldiers searched the entire ship. They tossed the kitchen, the hold, the saloon, the water storage and the sleeping quarter. They broke off all the hooks which secured the furniture in place and kept its doors closed, so all the contents were now free to fall out and scatter around making loud noises as the vessel rocked on the sea waves. They soon discovered that the engine was broken and the hold was full of water. They failed to fix the engine and threatened to keep beating up the captain until the engine was fixed. They searched everyone on board including the journalists. I was searched in the crew’s quarters by two women wearing masks. Cooking pots, cutlery and buckets rolled loose around the floor. “What are you looking for,” I asked. “Tiny chips,” they answered. “This is just a procedure,” came the response. It was also just a procedure for them to offer everyone fruit and water. The military could use some footage showing them treating the boat passengers to the produce of the Israeli land. But everyone refused. By about 07:00, the soldiers finally managed to fix the engine, yet they couldn’t properly maneuver the vessel. Instead of moving, it was shaking, rocking and going in circles. They decided to try full throttle. Captain Joel responded with a melancholy remark that the only thing they were going to achieve that way was to kill the engine. They slowed down. Their orders were to deliver the vessel to port, but they had no tugboat. Most of the Israeli soldiers were seasick by that time. We were sitting in the shade under a canopy as that was the only place they could hold all of us at gunpoint – but the soldiers themselves had to stay in the sun. In the evening, two helicopters flew over the trawler. We finally saw the lights of Ashdod when it was already dark. The port was full of military, there were no reporters. The only cameras rolling were with the military, too. They called us out by name, one by one. The first to go were Knesset member Ghattas, ex-president Marzouki, and European Parliament member Ana Miranda as we applauded them. They were searched and let go after their phones were confiscated. The next was the Israeli journalist. When I was finally let off the boat I said that I refused to answer any questions, provide my identity, have my fingerprints taken, or be photographed until I had received consular and legal assistance, and that this was an illegal abduction of an accredited journalist accompanied by theft of my property, i.e. my satellite and mobile phone. I was asked to take off the cap featuring my TV company’s logo that I was wearing. I refused to do so. But they didn’t. Two young soldiers, male and female, were assigned to guard me. As I went on through the procedure they were growing more and more sympathetic towards me. And then I saw that all of this - all the tents, desks and flags. It was brought and put up here only for us. There were no other passengers coming ashore at the port. Hundreds of soldiers came here for us and our small single-deck vessel. I was searched again, as were the contents of my small bag. They went through my garments and undergarments several times feeling them thoroughly and even scrutinizing them against the light. During the search my cellular phone charger was taken. Then I was taken to a tent where a young man and a young woman made themselves look like doctors. I refused to give them my name yet again, demanding a lawyer and a consul. “For your own good we want to find out if you have any diseases,” they said. “I do not need it. My company takes care of me, I am insured,” I responded. I broke into laughter. The word “collaborate” has but one connotation to the Russian ear: it means “collaboration with your enemy”. When my visit to the so-called doctors was over, I refused to move any further before the company’s property – the cellular and mobile phones – were returned to me. The military people started fussing around. Some of them tried to explain that it would not be possible. Others called for their bosses. The bosses also explained that it could not be done at the moment, but maybe sometime later… But I was unperturbed. I stood right in the middle of the port with my RT cap on and demanded a lawyer, a consul and my corporate telephones. In the long run they agreed to give me a paper testifying to the fact that the property had been taken by the Israeli army. It was signed, dated and contained the property list. I asked for my charger, and it was given back to me. Another search followed. They asked me to remove my cross. I said “no”. They took away all my cash, bank cards, a nail file, a pen, chargers, a brooch. And – strange! – RT stickers. Then I was placed into a police wagon. There I found Kajsa Ekis Ekman, the Swedish journalist. Soon we were joined by a New Zealand journalist, named Ru. Their case was even more interesting than mine. 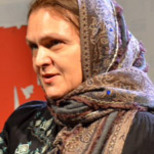 The Israelis tried to convince Ru that she was not a journalist, but an activist. And to Kajsa Ekis Ekman they explained that it would be better for her to write books on female circumcision than neo-capitalism. At 4:00 am we were brought to the Givon jail facility and searched again. This time I was deprived of my white gloves and some other trifles. My shampoo disappeared without trace. Our cell contained three iron bunk beds, a close-stool behind a little iron door, a shower behind a similar door and opaque windows under the ceiling with a camera installed in it. We were placed in a special one-story building in a special section of the jail. The walls boasted all sorts of graffiti about freedom for Gaza and Palestine. So the three of us were grouped together in a cell and had no idea about the others. From somewhere upstairs, someone kept screaming. It was a standard procedure at 6 am and 10 pm. Every time they asked us to stand up, and every time we demanded a consul and a lawyer. “No, you are simply here. It’s nothing more than a check to see that you are fine and healthy,” they said. “This is my first time in Israel, and all I get to see is a jail,” she remarked. Ru signs papers and leaves the next day with her cameraman. Now there are two of us left in our cell, and I cannot just go leaving Kajsa Ekis Ekman behind. She cannot leave either. The Swedes cannot go leaving Dror Feiler behind. He was the one threatened before the flotilla’s departure, and during the interrogation. The woman responsible for booking tickets tries to persuade us that we agree to leave one by one. She tries to talk us into signing papers. Sometimes she speaks in the sweetest tone; other times, she promises that we will be taken away in handcuffs. We’d rather go for handcuffs. However she does turn her tone down each time. She is no longer saying that we had illegally penetrated the Israeli territory. It’s not clear anymore how we got here and what we’re doing here. Back in 2012, when the Estella boat was seized, they stole Dror Feiler’s saxophone, and locked him up separately from the others. When the others left for home, he was being beaten in his cell. Kajsa Ekis Ekman and I are playing hopscotch and battleship. We have already discussed Lenin, Trotsky, Marx, Brezhnev, Gorbachev, Yeltsin, the Greece situation, the Sweden situation, the Middle East conflict, the history of Russia starting from the Varangian princes (were they Swedish or not? ), Ikea, Swedish writers, Norwegian writers, Russian writers, fairy tales, composers, and film directors. Turns out Kajsa Ekis Ekman has read Velimir Khlebnikov’s poetry. Not many Russians could say likewise. We are willing to stay here as long as it takes them to realize that we are only leaving this place together. Kajsa Ekis Ekman asks me to teach her to pray in Russian. Now we pray together, then we do some work out, and then Kajsa Ekis Ekman sings songs about freedom in Greek. "I’ve heard that Russia’s favourite book by Lindgren is Karlsson. But her best book is about Pippi Longstocking," Kajsa Ekis Ekman said. The lawyers show up; and we win. We will all be sent home together on the same day, and the Swedes will not have to leave one by one. And they will take my phones to the embassy. Now that we have got it our way the guards break into our cells at night and light their flashlights in our faces for some reason. Sunday, July 5. They return our belongings according to the lists. This time, they had stolen 300 Euros from Dror alone. Sure she will. When else is she getting inmates who’d be discussing Trotsky for hours? We are now riding a large bus, with windows rather than bars. Then we undergo another search. We are then placed in a deportation jail near the airport. They never change sheets here; they serve food that’s expired a month ago; and you cannot get them to bring you water or tea. I am escorted onboard several minutes before take-off. My passport bears no evidence that I’ve spent time in Israel.